In this May 25, 2017 photo, baby eels swim in a bucket after being caught near Brewer, Maine. The fishery will shut down weeks early, at 6 a.m. Thursday, due to what the state said Wednesday are illegal sales. Maine’s lucrative elver fishery will shut down two weeks early — at 6 a.m. Thursday — due to what state regulators said Wednesday are illegal sales that jeopardize the Department of Marine Resources’ ability to manage the fishery. 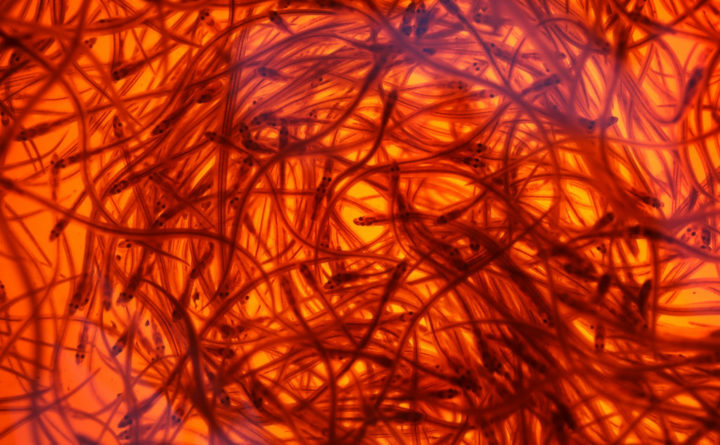 A Maine Marine Patrol investigation allegedly revealed that some elver dealers in Maine were paying substantially less per pound in cash for elvers than those that were harvested and accounted for through the state’s new swipe card system, according to a release from the DMR. In March, the price per pound for baby eels, also known as elvers, hit a record high of $2,700 to $2,800 per pound. The shutdown comes through emergency rulemaking. An investigation continues, and charges will be filed against dealers and harvesters who bought and sold elvers without using the state’s swipe card system. The system, implemented in 2014, records the weight and value of each sale and ensures that individual and overall quotas established by the state are not exceeded. The federal Atlantic States Marine Fisheries Commission sets the state’s overall quota, as well as individual quotas. As of Wednesday, 9,090.6 pounds of the state’s 9,688-pound quota had been sold legally through the swipe card system, according to a DMR release. But Marine Resources Commissioner Patrick Keliher said in the release that officials believe if the illegal sales had been recorded, the state would already have exceeded its 2018 quota. The closure is necessary to prevent depletion of the resource, he said. “This is a fishery that stood to net Maine license holders nearly $24 million this year, and now because of the greed of some dealers and harvesters, I am obligated to cut that opportunity short,” Keliher said. According to the new rule, licensed harvesters may not fish or take elvers after 6 a.m. Thursday. They may possess and sell them until noon Thursday. Licensed dealers may purchase elvers until noon Thursday, and possess legally purchased elvers until 6 a.m. on May 29. Darrell Young, president of the Maine Elver Fishermen Association, said Wednesday afternoon he was “in shock” upon hearing the news. Earlier this month, a Woolwich man known as the “grandfather of eel fishing” was sentenced to six months in prison for his role in an East Coast elver trafficking scheme that violated the federal Lacey Act. William “Bill” Sheldon, 71, bought and sold juvenile eels that he knew had been caught illegally, in states where the practice is banned. Sheldon is one of 21 men, 12 of whom live in Maine, who were charged in four states with participating in the scheme and altogether caught, sold or transported more than $5.25 million worth of illegally caught elvers from 2011 to 2014, prosecutors said. Nichols said that while the state has been in touch with the U.S. Fish & Wildlife Service, the current cases do not involve violation of the Lacey Act. Young, who fishes out of Ellsworth, said fishermen hear rumors about illegal fishing. “But you don’t believe it because you can’t do it and get away with it, especially the number of people they’re talking about,” he said. He said he suspects federal charges will eventually be filed, because in order to illegally sell elvers, someone would have to go at least as far as Boston. Young said he had been scheduled to meet with producers from HBO later this week to show them elver fishing for a television show, he said. Now he’ll have to call them and cancel.